These No Bake Sprouted Nut & Seed Granola Bars are an easy and delicious granola bar that’s way cleaner than most of what you can find at the grocery store! Best of all, you can customize them to suit your taste buds. 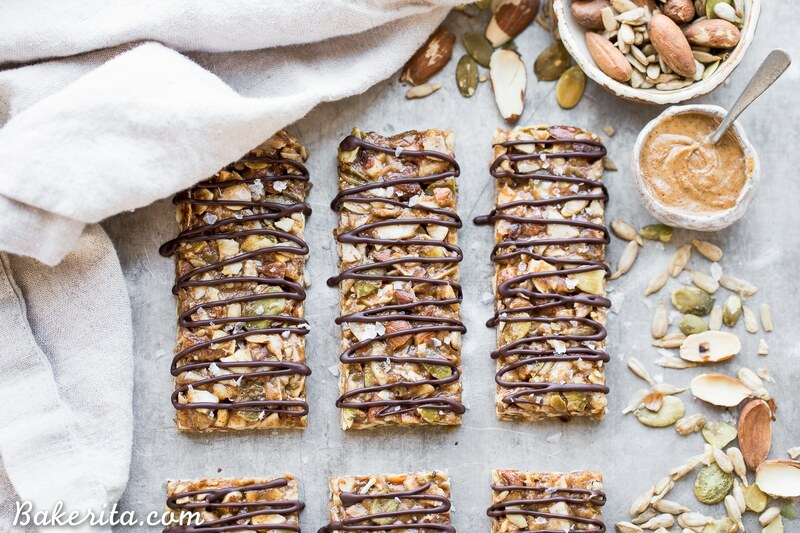 You’re going to love these gluten-free, paleo, and vegan granola bars! Are you a bar kind of person? 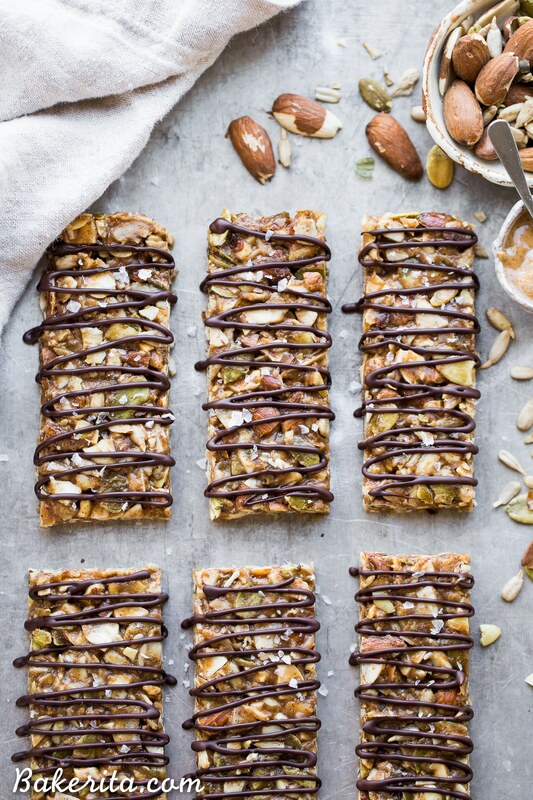 I’ve recently been becoming more of a granola bar person to satisfy my snack cravings when I need something quick, but to be honest, I usually prefer a full meal to eating a bar. Sometimes though, making a full meal is just not an option and I have to grab something on the way out the door so I don’t end up starving and unhappy. In that case, granola bars are a life-saver, and while there are many delicious granola bars out there, you know I’m always about the homemade when I can! I kept these easy and simple because I know that none of us want to spend a ton of time making a snack that’s meant to be a quick solution to your hunger. Because of that, they’re no-bake, and no-cook – all you’ve got to do is combine all of the ingredients, let them chill, and cut to size. 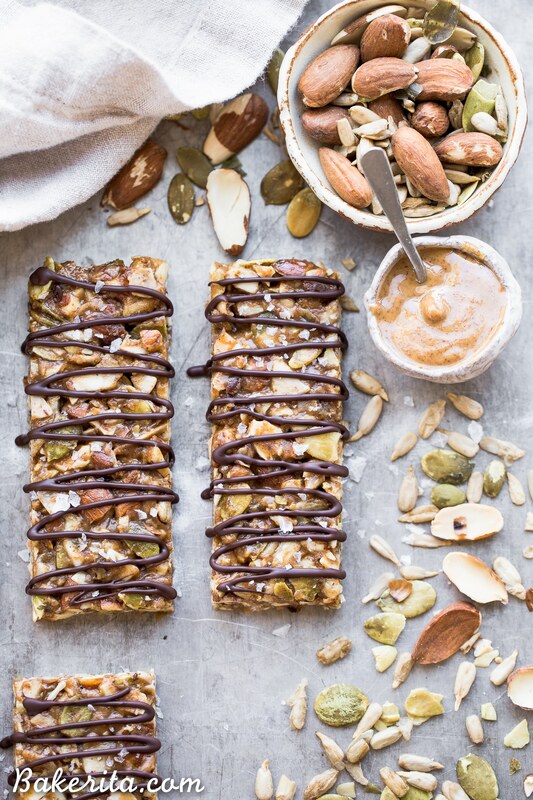 NO BAKE SPROUTED NUT & SEED GRANOLA BARS! The base of these bars uses a mix of sprouted nuts & seeds. I used sprouted almonds, sprouted pumpkin seeds, and sprouted sunflower seeds, and it was a delicious combo. You can use whatever sprouted nuts & seeds you’ve got on hand, and if you don’t have anything sprouted, regular nuts and seeds will totally do the trick. I just like using sprouted here because sprouted nuts and seeds are easier to digest, and sprouting helps remove an anti-nutrient that’s present in nuts called phytic acid, which prevents some nutrients from absorbing efficiently. Anyways, all the delicious and nutritious sprouted nuts and seeds (and there’s some flaked coconut in there, too!) are held together by a delicious nut butter – maple syrup – coconut oil situation. I added some salt, cinnamon, and vanilla for extra flavor, and that’s all there is to it. 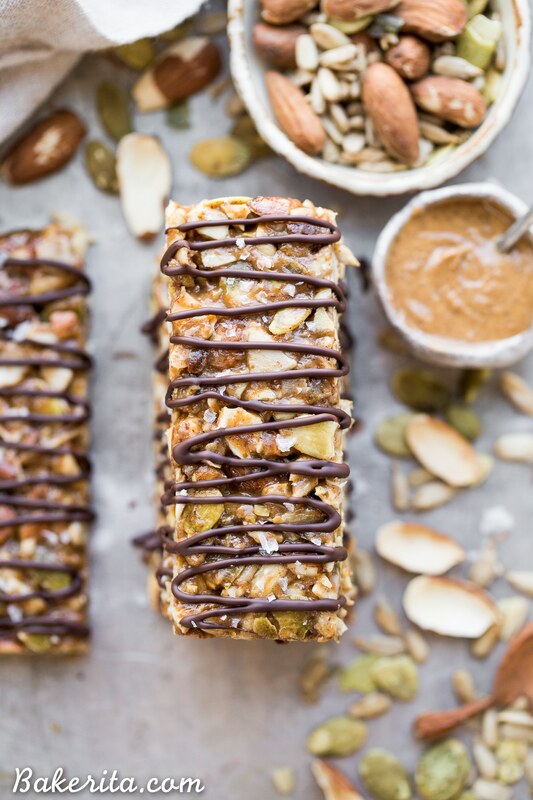 These No Bake Sprouted Nut & Seed Granola Bars are an easy and delicious granola bar that's way cleaner than most of what you can find at the grocery store! Best of all, you can customize them to suit your taste buds. 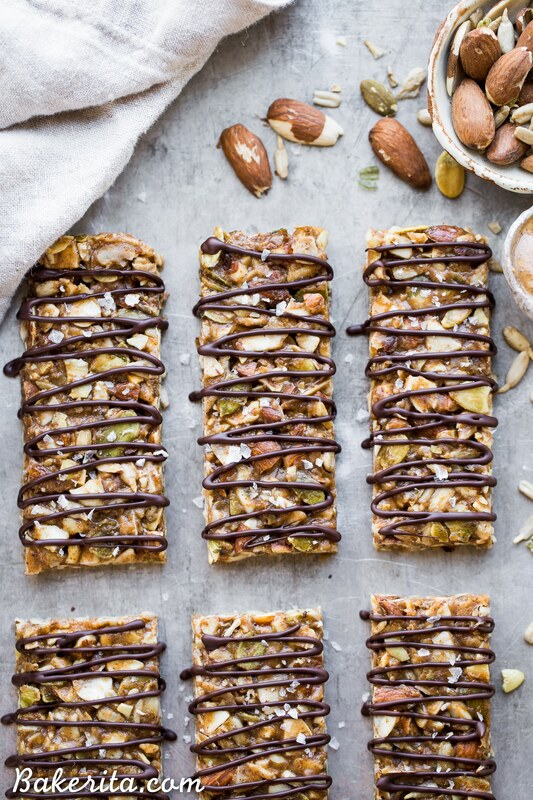 You're going to love these gluten-free, paleo, and vegan granola bars! Line an 8x8” square pan with parchment paper and lightly grease with coconut oil. Set aside. In a large mixing bowl, stir together the sprouted nuts & seeds, flaked coconut, kosher salt, and cinnamon. Stir together the almond butter, maple syrup, and coconut oil in a small microwave-safe bowl or liquid measuring cup. Microwave the mixture for 30 seconds - it should be hot and pour easily. Stir in the vanilla extract. Pour the nut butter/maple syrup mixture over the dry ingredients and stir until all of the dry ingredients are coated. Pour the sticky mixture into the prepared pan and then use a flat-bottomed drinking glass, measuring cup, or spatula to press the mixture into a firm, even layer in the pan. Cover and place in the refrigerator for at least 1 hour before cutting into 10 granola bars - the longer you let them set, the less crumbly they'll be when you cut into them. After the bars are cut, place the dark chocolate in a small microwave-safe bowl. Microwave in 30-second increments, stirring between each until the chocolate is completely melted and smooth. Use a fork to drizzle the chocolate over the bars, or put the melted chocolate in a small Ziplock/piping bag and snip the corner to drizzle over the bars. Store the granola bars in a sealed bag or container in the refrigerator for 2 weeks or in the freezer for a few months. I got my sprouted almonds, sprouted sunflower seeds, and sprouted pumpkin seeds from Nuts.com. You can also find them at many health food stores. So how do I get sprouted nus and seeds? You can sprout and dehydrate them yourself, or you can buy them sprouted online or at many health food stores! thank you. I do not have a dehydrator, so could I just make them without the sprouted version of the nuts? Hi! I really want to try the recipe, but am looking to add protein powder so I can take this to class to keep me full throughout the day. Any suggestions on how much to add? Thanks so much! I love your recipes! Hi Anna, I haven’t tried it that way and there are SO many different kinds of protein powders, that some may change the consistency. I’d just start by adding a couple scoops, and you can always add more in the texture doesn’t change! Sorry I can’t be more help. Enjoy!